Earlier this week, as I was watching the news about the two attacks in Germany, I kept remembering the times in which our country has endured similar moments. I remembered the shooting at Sandy Hook in Connecticut. I remembered the day of the September 11 attacks. I remembered the shootings at Columbine. These were events that occurred in our country where we were scared, angry and confused. The one thing I remember about those days and the days that followed was the desire that I had to do something, anything in order to help, and the feeling that in reality there was very little I could do. I’m sure that right here, today there are many people who can relate to these same feelings every time we witness unspeakable acts of evil. I wish I could tell you this will not happen again, but day after day we hear of wars in the Middle East, Christian persecution, Islamic terrorism, police shootings, and racial tensions; day after day this feeling that things are out of control and that there is nothing we can do gets stronger. If there is one thing that events like these teach us is this: The world is broken, and there is very little we can do to fix it. However there is one thing we CAN do: Pray, because it is us, the disciples of the Lord who hold the balance between a broken world of darkness and a world of hope, redemption, peace and love. We are like Abraham praying to God for the last 10 people in Sodom. 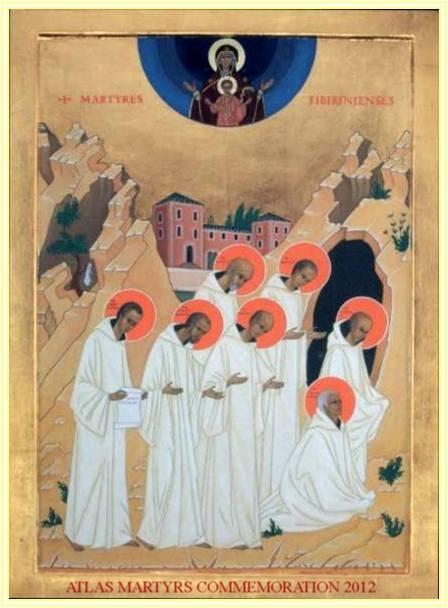 Every time I start feeling like this I recall the story of the 7 Trappist Martyrs of Algeria. I would like to tell you about them. "On Christmas Eve 1996 the Trappist monastery of Tibhirine in Algeria was preparing to celebrate Christmas mass when Islamic terrorists, who would later kidnap and kill them, invaded their church. After some initial threats, they informed the monks that if they did not leave the area they would return and kill them. The monks were badly shaken. They huddled together as a group for a time to digest what had just happened. Then, not knowing what else to do in the face of this threat and their fear, they celebrated the Christmas mass". In the words of their Abbott, Father Christian de Cherge: 'It’s what we had to do. It’s all we could do! It was the right thing to do' . After this event happened the monks took a vote to decide if they should leave or stay and continue ministering to the poor in Algeria. They all voted to stay. Months later the same men returned, kidnapped, and brutally murdered them. In today’s Gospel the disciples asked Jesus to teach them how to pray. This is quite a strange question because the Jews of this time knew the psalms almost by heart and prayed every morning and evening... and yet the disciples realized they did not know how to pray. Perhaps our feelings of not knowing what to do when we are confronted with evil are due to the fact that we, like the disciples, do not know how to pray. Jesus answers his disciples with a new prayer, new in the sense that none of them had ever talked to God in the way that it did. Up until this moment in Jewish prayer, God was distant, a remote and divine king. Jesus makes His prayer personal by calling God “Abba”, or Daddy, and asking for simple things. He talks to God like a man talks to another man or a child speaks to a parent. This is the type of prayer we need in order to counter the darkness of the world. I’m not saying that rosaries and novenas do not have their place, but when we really need to connect with the Father, like Jesus connected, we have to let our hearts speak through our mouths. Before Islamic terrorists returned to kidnap the 7 Trappist martyrs of Algiers, they had a few weeks to prepare and write their testaments. I would like to finish my homily, by reading you some passages from Father de Cherge's last testament, which he wrote in the form of a prayer. "If it should happen one day that I become a victim of the terrorism which now seems ready to encompass all the foreigners living in Algeria, I would like my community, my Church, my family, to remember that my life was given to God and to this country. I ask them to accept that the One Master of all life was not a stranger to this brutal departure."